Moonlighting was mainly made by the exiled Jerzy Skolimowski in his house in West London. It is a film both prosaic and political but also savagely funny. As usual, autobiographical elements intrude. His house was in the process of renovation at the time, and three of the Polish builders featured in the film actually worked on it. Meanwhile Skolimowski makes a brief appearance as the shady house-owning diplomat who has hired the workers on a month’s starvation wages. (In flashback he appears sitting next to them and the foreman’s wife at a Tina Turner concert in Warsaw.) The Kensington home is thus a “character” in the film that saved studio costs and cut down on locations, a prime consideration for a director with little money who was responding immediately to the sudden imposition of Martial Law in Poland. 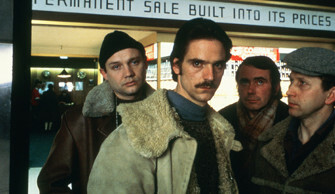 A bigger expense was the inspired casting of Jeremy Irons as the foreman who has to react to this sudden catastrophe and the suppression of Polish Solidarity. This was a scenario Skolimowski wrote and filmed quickly in the middle of a London winter, with Irons playing the glum and doleful Nowak, leader of the quartet. Shot soon after Christmas, the film uses retro-Christmas motifs with carol singers, Christmas trees, Christmas Mass and shoplifted turkeys. In much of British cinema, the world of work is usually real in a documentary or realist sense: but here it seems both documentary-like and surreal at the same time, stranger than fiction yet stronger than fact, its insane contradictions a source of our uneasy laughter. And this is the one film in the director’s expatriate career, apart from Deep End (1970), where the surrealism of the material image triumphs utterly. Part of that triumph lies in the film’s rhythm and its accretion of detail, such as the workers’ daily grind of knocking through interior walls and rewiring rooms with primitive tools brought in from Warsaw amidst an endless dust storm and failing to get a signal for their junk shop TV, their only leisure activity. But the surreal is acoustic as well as visual and this is evident in the use of language, or indeed its absence. Irons is an English actor playing a Pole but speaking nearly always in English (the narrative is framed through Irons’ voiceover). In his brief exchanges with fellow Poles, we have Irons talking English-accented Polish: in his substantial voiceover and dealings with the locals we have Irons mimicking Polish-accented English. The dominant Polish voice is thus English, a device that Skolimowski plays up by almost never having the other Poles talk amongst each other. As part of their bafflement at this strange new world where they sleep rough on the floor of the house, understand not a word of English, eat starvation rations and have no money to spend, they are literally struck dumb, lost for words. Their silence suggests their language itself has been taken from them. Yet the film also intimates that what happens in London runs parallel to what happens in Warsaw. The diplomat’s cheapskate deal means the workers are no better off in London, while his liking for Anna, Nowak’s attractive wife, means that Nowak’s stay is dogged by suspicion about what is happening behind his back – back there. Skolimowski plays on the anxiety by parallax means, through a secret assignation witnessed by Nowak that takes place in the house opposite, between a young woman who looks like Anna and a visiting lover who looks like “Skolimowski”. Not only has “Skolimowski” not given Nowak enough money for materials and expenses, he has left a question mark hanging over the poor guy’s marriage. Yet all this pales before the politics that are set to unfold. In newspaper headlines one morning, Nowak reads of the overnight imposition of Martial Law in Poland: on TV screens in shopwindows he sees armed police manning barriers and tanks rolling along the streets of the capital. A film about the surrealism of work suddenly becomes a film about the trauma of politics, but as events progress it becomes impossible to disentangle them. Nowak decides to conceal the awful truth from his unsuspecting workers until the contract is completed. Like Roman Polanski’s Cul-de-Sac (1966), Moonlighting positions itself right on the trauma/anti-trauma boundary of British cinema. Events that horrify become outrageously funny: events that might cause permanent damage to the mind lead to behaviour that is faintly ridiculous. In order to protect his workers from the trauma of knowing the worse, Nowak shrouds them in the veil of ignorance. He tears down Solidarity protest notices on street walls so they will not see them, ushers them quickly past TV shop windows, leaves them at home on shopping trips, prevents them from trying to call home from the local phone box, intercepts their intercepted mail (the Polish authorities first, Nowak second), and finally stops them attending Mass. They become virtual prisoners in their chaotic workplace. Thus he repeats in miniature the strictures of silence, curfew and house arrest that the new regime has imposed back home. His trauma-response to the unexpected Event leads to a compulsion to repeat its worst effects. In order that they do not suffer the knowledge that he has suffered, they are made to endure a version of what all Poles back home are enduring, even though in London they are ostensibly placed in an information-free zone. Their space-capsule London, where they see and understand nothing, becomes a surreal version of Warsaw under curfew. Meanwhile Nowak can only sustain this pretence and get them to finish the work on time by shoplifting instead of paying grocery bills for which he no longer has any money. Inside the house he is a devious autocrat, outside a petty criminal. The main difference between Warsaw and London (since they are rapidly becoming alike) becomes food queues versus supermarkets, a little money to buy food that is scarce versus no money to buy food that is plentiful. The second part of the film consumes itself with Nowak’s tortuous cover-up in which the received idea of Polish workers as heroic dissidents, as seen in Andrzej Wajda’s didactic pro-Solidarity film Czlowiek z selaza/Man of Iron (1981), never materialises. But that is because Skolimowski is supremely unpredictable. Traumatised by the crushing of Solidarity, Nowak turns into a petty dictator in exile. Yet Moonlighting ends on a note of surreal farce. The one and only treat enjoyed by the grimy builders (unaware their boss is a shoplifter) is a trip to a department store supervised by Nowak to buy cheap watches for their return. On the first stage of their journey home, a six-hour walk out to Heathrow pushing shopping trolleys full of luggage, the bemused Polish trio finally hear the truth from their duplicitous leader about events in their homeland. Nowak ends the film bruised and beaten on the tarmac of some anonymous car park, getting his just desserts. It is a defiant, anti-heroic ending redolent of human frailty. John Orr is Professor Emeritus at the University of Edinburgh, the author of Contemporary Cinema (Edinburgh University Press, 1998) and Hitchcock and 20th Century Cinema (Wallflower Press, 2005), and co-editor with Elzbieta Ostrowska of The Cinema of Roman Polanski (Wallflower Press, 2006).